If President Barack Obama and his counterparts in the western hemisphere are serious about improving the dysfunctional dance known as U.S.-Latin American relations, they need only look at what transpired in Ecuador this weekend. President Rafael Correa rather petulantly expelled a U.S. diplomat on Saturday. He did so because the diplomat rather high-handedly sent Correa's national police commander a letter saying the U.S. was pulling $340,000 in aid to Ecuador's anti-drug cops, because Correa decided last year not to let Washington have a veto over who runs that force and even who works for it. On the other hand, it demonstrates how impulsively many Latin American governments, especially those like Ecuador that are part of the region's resurgent left, confuse national sovereignty with their own idea that foreign aid should be provided gratis and without political strings. Because Latin military and security forces have an unfortunate history of sliding into drug lords' pockets  a former Ecuadorean deputy interior minister under Correa was recently charged with drug trafficking  it's not all that outrageous that the U.S. ask to have some input in exchange for aid (or "logistical support," per Astorga). The point is that Washington and Quito could have worked this out more maturely than the outcome shows. 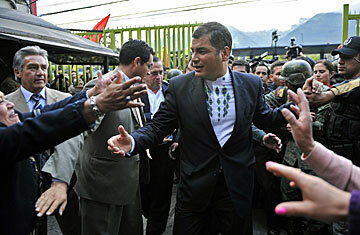 The U.S. could have, and should have, been better tuned in to the fact that Correa, love him or hate him, is not one of the obliging military strongmen or feckless oligarchs that used to run Ecuador, and that his anti-American agenda has been pretty clear since he won the presidency in 2006. He recently decided not to renew the U.S. lease at Ecuador's Manta air base (although, ironically, he said Saturday he would grant U.S. planes limited use of the base at Quito's discretion). Last year he defaulted on some $3 billion of Ecuador's $10 billion foreign debt, saying the loans had been contracted "immorally and illegitimately" a generation ago when the nation was run by dictators. So it wasn't a shock when Correa, a master at using anti-yanqui bluster to domestic political advantage, last year told the Americans he would no longer accept their veto privilege regarding the top brass of the Anti-Contraband Operations Unit. Nevertheless, early last month, Astorga sent his letter to National Police Commander Jaime Hurtado  informing the top cop not only that the U.S. was terminating the aid but that the force would have to return all furniture, cars and equipment donated by the U.S. in the past. To which Correa on Saturday replied, "Señor Astorga, keep your dirty money, we don't need it." He's also ordered Hurtado to return the equipment: "Let them keep their things. Ecuador doesn't need charity."